A long, beautiful sandy crescent set back from the wind. In a nutshell: A long, beautiful sandy crescent set back from the wind. White Rock is also known as Palauea Beach. This is a nice, wide, uncrowded and lesser-known beach. You won’t see very many tourists here – mostly populated by a few local folks and fishermen, on weekends family and friends join in on the fun. What’s left of the small kiawe forest is cut up into private lots which have been seeing high-end vacation home development over recent years. The neighborhood has hired a security guard who has the unenviable (and endless) job of telling the locals who have long used the trees along the margins for shade and relaxation, to move onto the public beach. 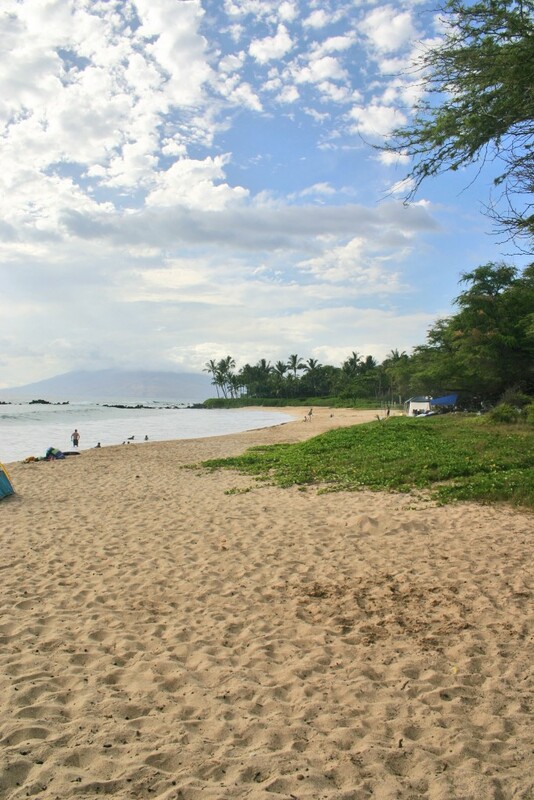 There are a few public access trails strategically located, and parking along the undeveloped portions of Makena Road (so far) remains unrestricted. Snorkeling is excellent around the rocky outcroppings at both ends of the beach, with the south end being a bit larger and slightly clearer. Boogie boarding is also decent during south swells and perfect for kiddies or beginners when seas are calm. The sandy bottom entry is sloped gently for swimming and playing. Note: During Kona storms or large swells the ocean here can become unsafe with rip currents. Roger — there is a public park with full beach access that has pretty kiawe trees on the south end of the beach so chill out bruddah you will be able to go sun yourself without having to call the Popo. Just be careful dive master bruddah cuz there be plenty o sharks near this beach. They chomped a German tourist lady to death last year and took a guys leg this year. Don’t go out after it rains! !